When choosing what type of flooring is best for your home, rely on us to help you consider which option works best for your needs. Carpet flooring is a long-lasting and comfortable material, which always looks warm and welcoming in all types of residences. Our collections include many affordably priced options, so you can update your home’s floors on any kind of budget. 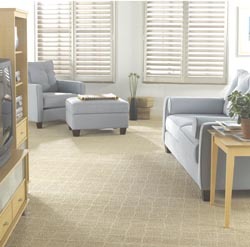 If you’re interested in quality, discounted carpet, stop by and peruse our selections. Our store offers carpeting in numerous colors, patterns, materials, and styles, so you’re sure to find something that matches your particular style. Carpet adds a distinct warmth and softness to a room. It can also help add extra insulation during cold months, helping your home stay warm. For families who have young children or grandparents in their home, it also provides a slip-resistant surface, making it a safe and solid choice. Are you having carpeting installed in a large home? Carpets can help lessen noise by absorbing sounds from foot traffic, especially between floors. Whether you're freshening up an existing room or beginning a new addition, home carpeting is a great way to change up the look of your residence. With hundreds of color hues and textures to select from, the design options are limitless. Our flooring specialists will find the right carpet for your home. Another amazing benefit of carpet is its sustainability. A majority of all worn carpet collected by manufacturers is recycled in order to create new carpet flooring. You’ll feel great about your flooring’s impact on the environment when you purchase a new carpet. Not only is carpet sustainable, it’s also relatively easy to maintain. You won’t have to worry about scuffing or scratching your new carpet floor. There are many immediate benefits to adding new carpet flooring to your home. Carpet is available in many patterns, colors, and pile heights, which means it can be customized to suit any home decoration style. With the right combination of carpet flooring and décor, even the simplest living space can be instantly transformed into an enticing and attractive area in your home. Your carpet will last for many years with good care and maintenance. Make sure it looks amazing with a carpet installation from our professionals. Our carpet prices are the best and so are our installation services. With experienced technicians on staff, you’re going love the results. Modernize the look of your home and add value to your property with the purchase of a new carpet. When you choose any of these superior products, you can be sure that your carpets will last for years to come. We offer great deals on all of our flooring options, saving you money on a stunning new carpet. If you’ve been on the fence about replacing your existing carpet or adding new carpeting to your home, now is the perfect time to act. There’s never been a better time to update your home’s flooring. There are many reasons to consider purchasing an area rug for your home. First, rugs allow you to transform the appearance of any room. Rugs tie your existing colors and décor together in a way that delights the eye. With a beautiful new area rug from our company, your unattractive or outdated spaces will have a fresh new look. Second, an area rug is the perfect way to create a natural center to your room. Placing a rug on one side of your room allows you to establish a separate zone, which is perfect for mixed-use spaces. For example, you may wish to separate your dining space from your living room or family room area. A rug acts as an anchor for your furniture and decorations, clearly delineating the areas in a room. Finally, purchasing a rug is a great way to conceal problematic areas on your floors or carpets in an inexpensive way. Using a rug to hide stains or flooring damage is more affordable than having the entire carpet replaced. Whatever your particular rug needs happen to be, you can be certain that we’ll find the perfect rug for your home. Contact us when you need carpet flooring. We serve our clients in Humble, Kinwood, The Woodlands, Houston, and Huffman, Texas.